The first prototype is ready to show. Now we start to tweek and refine. If you are interested in pre-ordering one head on over to my site. Order before Oct 26th and get it for the early-bird price of $50, a $15 savings. Here's a finished color render of the project I'm working on. If you are interested in pre-ordering one, head on over to my site. Almost done with the initial prototyping. I'm super stoked. Only the back pack and hand gun left to do. I am probably also going to re-work the shoulders a bit they are a little loose, but that's what prototypes are for right? So, I've been working on a personal project for some time. I though, why not see what you all think. Still a work in progress, but I thought it was enough to show. I need to re-work the knees (and you know print the rest) but so far I'm lovin' it! Having fun with Robots again! So, as you may have noticed, I've been getting back into TF-related work doing some things for 3rd party groups Mastermind Creations and Mech Ideas. It's been fun, and soon they say they'll maybe let me design a few toys... who knows! I am working on a new way to make and distribute customizable transforming robot action figures. Where you get to chose the look,colors and accessories for your bot the way you want them. Concept drawings rendered model images and prototype pics are all on their way. But in order to do that I need to see if my process is viable, both in financially and physically. So, first I’ll be doing a few fan figures that are more recognizable, bots I have loved for years. Now with a few toy designs under my belt and some more experience in creative manufacturing techniques, and armed with some pretty nice 3D printers I am finally going to bring life to an idea I’ve been working on since my Roadbuster upgrade days. 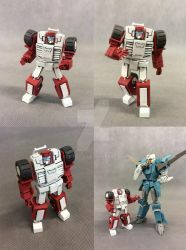 Custom one-off transforming robots. That’s right, you the consumer get to chose your own character, its look, its vehicle mode, its accessories, weapons, color, even how it transforms. You name it it’s yours. We will supplement these custom figures with some basic “standard color” units for you to fill out your army, but really the sky is the limit. But first I'm going to start my toy shop re-doing some of the favorites figures from my collection. I'll start with some from the Unicron Trilogy and move on from there. hello im semir10000 and i love transformers. i have only been on devainart for 5 days but i made a lot of ben 10 aliens. im really good at making aliens. but i want to star making my own version of transformers too. its called transformers dragon wars, i version of transformers that involves the atobots and there dragon forms, and the decipticons and there monster/demon forms. i have lots of ideas for it but i can draw any king of transformer if my life dependit on it. aliens i can do. transformers i cant. 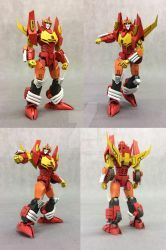 one thing i really want is to also add a power-full extra to the transformers dragon wars power house. the dinobots, i want to bring them to the battle in bigger and stronger looks and forms. i saw your art while i was looking down this page for ideas and i took a long look at your art and i have to say you are one of the beast. so how about this, can you please make and send me some transformers characters. it would really help. id be happy to trad or make a good duel for you. please, i really need your help. please. i really need help with a character called snarl. i want him to look bigger,taller,and more spikes then ever before. Great gallery you got there! No problem, thanks for the Fav! I GIVEZ YOU A LLAMA! hey nato. i was looking through your gallery. tell me are you designing all these on your own? are you the primary designer.? are these transformer designs based on already existing characters ? i took a look at your site and the molds you have created are really detailed. please tell me more about this ! AS far as my Transformers go, I'm just a fan artist. Most of TF the designs are based off of older "G1" characters. When Binal-Tech came out several years ago I started working on add-on kits for them. Unfortunately I had some money issues and none of those where produced. I kept working on designing here and there and eventually got work with "The Asylum" (a direct-to-DVD movie company) doing a projects then called "Leigh Scott's Robot Wars" which when the Transformers movie came out in 07 the title got changed to "Transmorphers". Soon after Mr. Scott left the Asylum and I went back to trying my hands at toys (as well as other menial labor to pay the bills). I was finally able to produce one of my toy designs last year (an add-on kit for the Transformers Universe "Roadbuster" toy by Hasbro). And just recently I got another job with Mr. Scott's new independent film company "Blackthorn Pictures" as the Conceptual Designer. I have several more model kit ideas in the works and hopping to get back to producing them after we wrap our first movie. As it is I stay pretty busy with work.